You cannot buy this membership. You can win only! Watch your favourite videos and earn Satoshi! BITCOINCLICKER - The best way to earn free Bitcoin online! Here you can earn Bitcoin in different ways. Current amount of Satoshi needed for withdraw: 2000 Satoshi. All payouts are instant directly to Faucethub if amount requested is inferior to 8000 Satoshi.For amounts higher than 8000 Satoshi they will be manually reviewed, approved then sent on your Faucethub.io wallet address. Standard users can request maximum 1 payout per day. 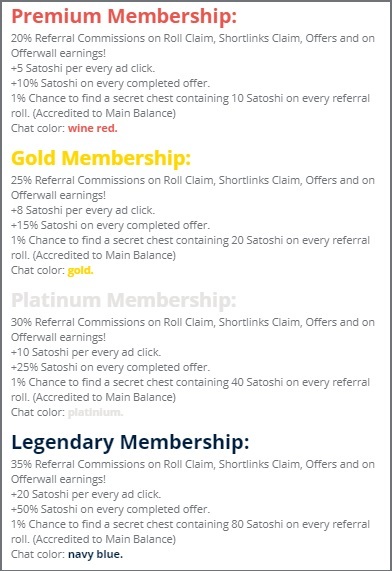 Standard users can request maximum 10000000 Satoshi per day.